A remarkable location. Just three blocks south of the historic Taos Plaza, off Kit Carson Drive, up a quiet lane. 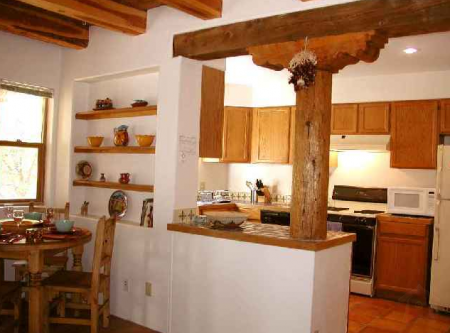 Walk to everything from this charming 2 bedroom, 1.5 bath casita. 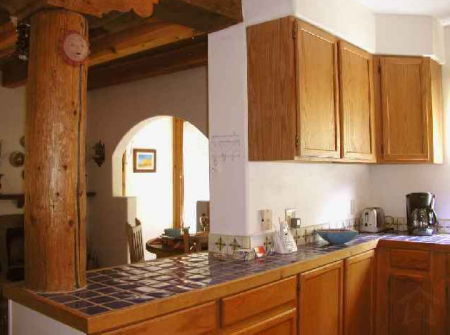 Tastefully furnished with rustic southwestern furniture and original New Mexico art. Beamed ceilings, tile floors with radiant heating, and living room fireplace make this a cozy retreat for any season. Two upstairs bedrooms, master with sunny deck, and second bedroom (set up as 2 twins or king) complemented with an adjacent private patio with 4 person hot tub, gas grill, and outdoor dining. Very convenient and close to town, but quiet and enjoyable. 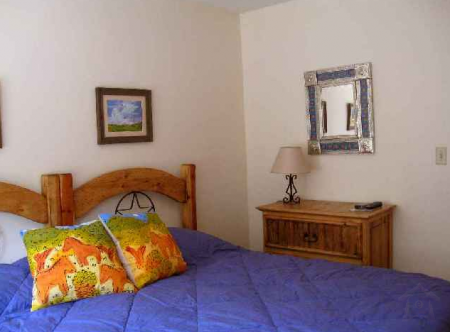 Of particular interest guests, may appreciate knowing the adjoining casita "La Placita" can sleep 4 additional guests should your group want closeness with added privacy. CANCELLATION POLICY: More than 30 days before arrival (60 days Xmas/NYs, Spring Break, and reservations of 14 or more nights) cancellation fee is 21% of total reservation. Less than 30 days before arrival, (60 days Xmas/NY's, Spring Break, and reservations of 14 or more nights) forfeiture of 100% of full reservation unless property is rebooked for entire stay at same rate. If booked for less, refund portion will be prorated (less the 21% cancellation fee). There are no refunds for late arrival or early departure.